Fred. 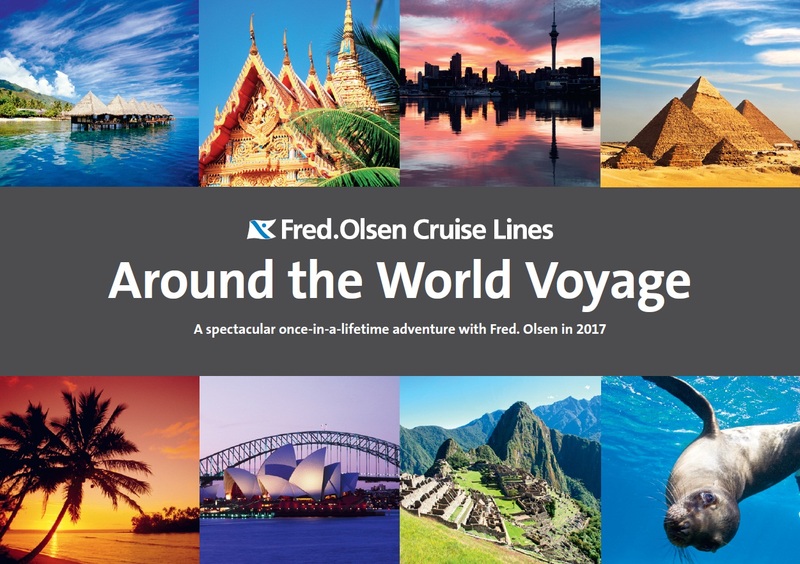 Olsen Cruise Lines has launched a new ‘Around the World Voyage’ brochure detailing its 107-night world cruise planned for early 2017. The cruise begins at Southampton on 3 January 2017 aboard the smaller, more intimate Black Watch. She will make her first stop in Funchal, on the ‘Garden Island’ of Madeira, before heading across the Atlantic Ocean to the Caribbean, calling at Bridgetown (Barbados), Kralendijk (Bonaire) and Oranjestad (Aruba), before cruising through the spectacular Panama Canal. The cruise will then call at Manta (Ecuador) before an overnight stay at Callao (Peru). General San Martin (Peru) is next before cruising Isla Salas y Gómez. The ship will continue onto Hanga Roa (Chile) and then Papeete (Tahiti), French Polynesia’s largest island, where guests can explore lagoons, black and white sand beaches and volcanoes. After a further call to Bora Bora (Society Islands, French Polynesia), the ship will arrive in Rarotonga (Cook Islands). Guests will then cross the International Date Line and lose a day, before sailing to Auckland (New Zealand) for an overnight stay. Calls to Tauranga and Wellington are also scheduled. The ship will then arrive in Australia with a call to Eden and an overnight call to Sydney where guests can visit the famous Opera House, or take a stroll along the iconic Sydney Harbour Bridge. A call to Brisbane will follow before the ship cruises the Great Barrier Reef. Black Watch will then take in Australia’s Hamilton Island, Townsville, Cairns and Darwin, before continuing onto Komodo Island, in Indonesia. The ship will then take in the spiritual land of Benoa, in Bali, before spending two nights in Singapore. Malaysia’s multi-cultural hub, Kuala Lumpur, will be next (via Port Klang), followed by Phuket (Thailand), and Sri Lanka’s colourful Hambantota and Colombo. Two calls, Uligamu and Utheemu, in the Maldives will follow before the vessel will arrive in Salalah (Oman). From here she will sail onto Egypt’s Safaga, Sharm el-Sheikh, and through the Suez Canal, to historic Alexandria. Malta’s cosmopolitan capital, Valletta, is scheduled before Black Watch heads to her final port of call in Malaga, Spain. This epic journey will then draw to an end back in Southampton on 21 April 2017. Prices for this world cruise start from £9,999 per person based on two sharing an Inside cabin, including accommodation, all meals and entertainment on-board, and port taxes. Additionally, Fred. Olsen Cruise Lines are currently offering up to £550 per person free on-board spending credit on Outside cabins or above (the amount varies by cabin grade). Solo travellers can also benefit from reduced single supplement on selected twin Outside cabins (subject to availability).